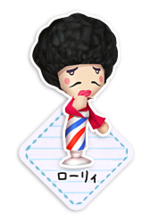 In Magician’s Quest: Mysterious Times, Roley is the owner of the Mon Paris hair salon and acts as the town’s hair-stylist. He is coded as gay throughout the game, and mentions wanting to find the “man of his dreams” to player in an optional conversation. This entry was posted in 2000s, Characters, Gay, Gay (explicit), Queer Men on February 12, 2017 by Adrienne Shaw.